Though I’ve mentioned this work in a previous post, it seems pertinent to make it the subject of a post now given that, like David Černý’s Quo Vadis, the basis of the work is a car as a signifier of world events. 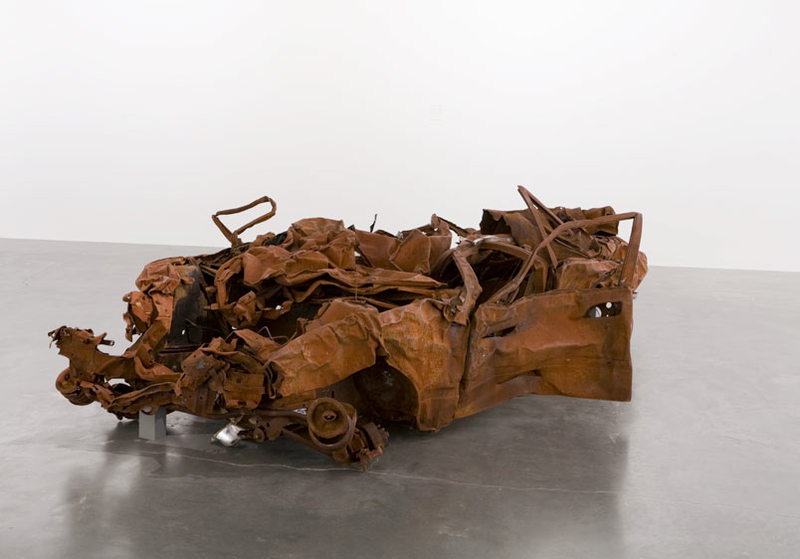 The car in Jeremy Deller’s It is what it is, was destroyed in a suicide bomb attack in Iraq in 2007. The mangled wreckage here, as is often the case in media reports of war, stands in for the destruction of human life, in this case the deaths of thirty eight people. Though we are all too used to seeing images of such vehicles, finding oneself confronted with the real thing is a wholly different experience. Deller has gone beyond this though and taken the wrecked car on a road trip around America, using it as a catalyst for discussion about Iraq. 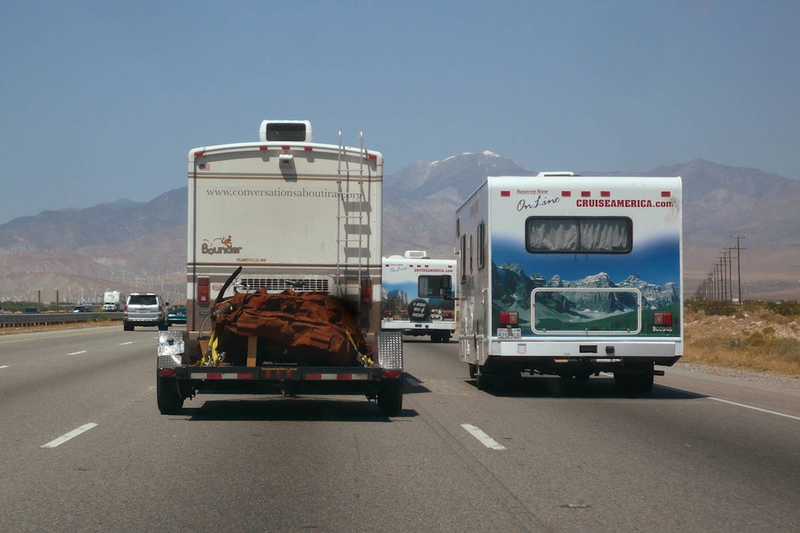 The car and the road trip have enormous relevance in American culture meaning that people were immediately curious about the wreckage when the truck parked up. To facilitate dialogue about the war, Deller was accompanied by two people with first hand experience of the Iraq war: and Iraqi artist who, having worked as a translator for the Americans, now lives in exile and an American soldier who served in Iraq. Conversations between these two experts and passers by were recorded and posted in YouTube. 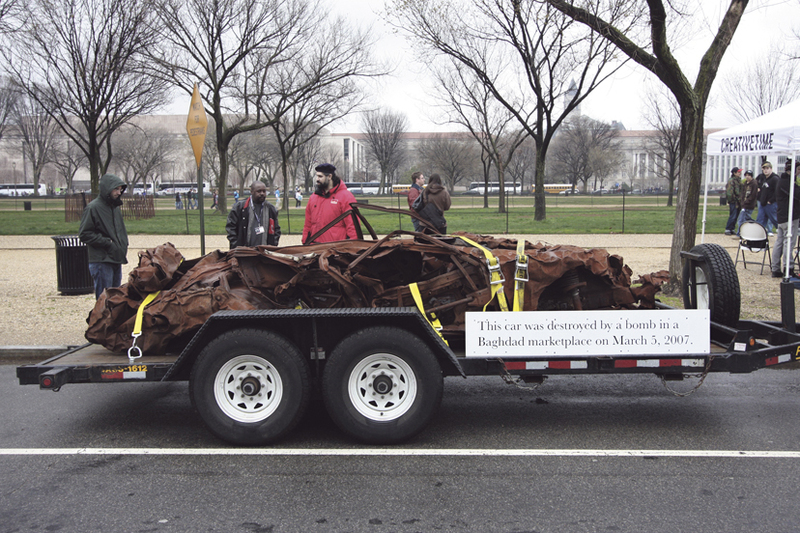 The question of why this particular artefact was chosen rather than something destroyed by the Americans – raised in the videos made in Washington DC – is an interesting one; Deller acknowledges that this would be a less ambiguous statement though he argues, in my view rightly, that the car here stands for the conflict in Iraq in general terms and that that conflict was started by the Americans: the car bomb is a consequence of the US invasion. The car has also been brought into gallery spaces – such as the Hayward Gallery, which is the context in which I mentioned the work before – where it is also used as a trigger for discussion, again with people who have personal experience of the conflict. As a symbol of the human cost of the war, the car is very powerful. The familiarity of the car as an artefact helps to bring home the context and the fact those paying the greatest price for the war are the Iraqi people. In many ways using a car destroyed by a car bomb – by terrorist rather than military action – could be seen as a cop out but I think there’s perhaps a stronger argument that says that it opens up the dialogue in a way that might not have been possible with a more politically loaded artefact. 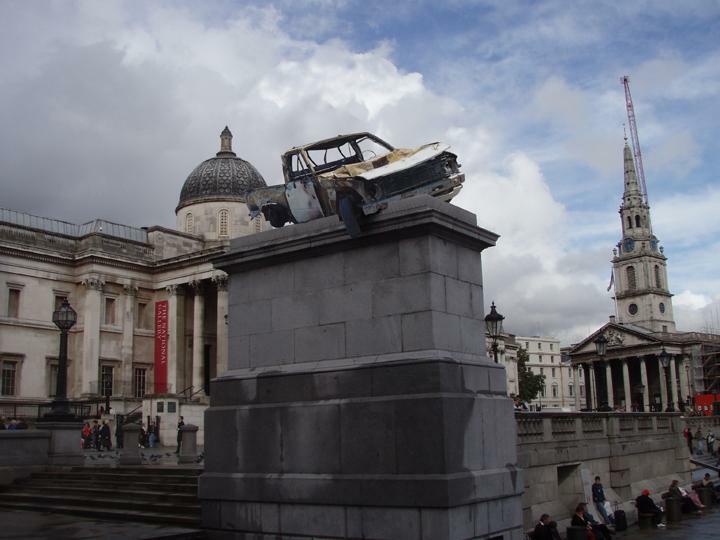 Deller’s first proposed use of a car damaged in the conflict in Iraq was as a sculpture for the fourth plinth in Trafalgar Square. Given the long history of the square as a site for public protest, this would have had a real resonance. Though I would have liked to see the Deller proposal accepted, I think the road trip was ultimately a more powerful gesture. This entry was posted in Politics, Public Art and tagged art, Conversations about Iraq, It is what it is, It is what it is: conversations about Iraq, Jeremy Deller, public art, sculpture by Ann Jones. Bookmark the permalink. This is such an interesting post, and a resonant work. I agree with you – the choice of a car destroyed by military action would have made any discussion one-dimensional and made it easy to compartmentalise the work and thus dismiss it. He’s a very interesting artist.